Our fantastic new church halls are at the heart of our ministry at Redland. We use them for our Sunday morning service each week as well as Ignite, our Family Service, for Lantern Pre-school, Toddlers and the Chat-a-Box holiday club and many of our other church and community activities; and they are also available for hire to local people and community groups for meetings and events. Our booking rates range from £12 to £50 per hour depending on the halls(s)/room(s) required. For full details of the facilities available and room specifications and to book, please contact the church office. You can use this link to access the Halls Booking Enquiry form to get in touch with the church office if you are considering making a booking. Please note that submitting the form does not constitute a booking. Our halls booking terms & conditions can be found here. Scroll down to see the range of activities currently going on in the halls; for some specific details about booking the halls for wedding receptions; for images of the halls set up for meetings or performances; and for detailed location and access information. 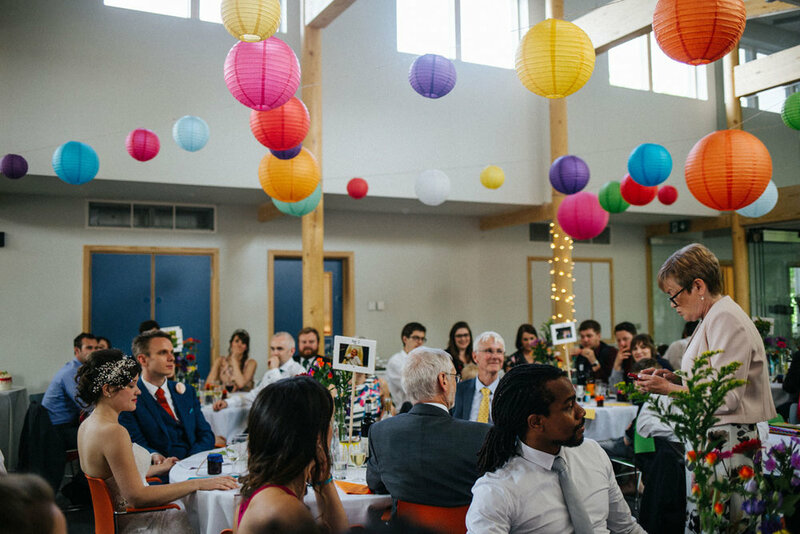 Since reopening, Redland church halls have hosted many fabulous wedding receptions, whether linked to marriage services in our church or in other venues. They provide a large versatile space with plenty of tables and chairs available as well as tableware. To enquire about booking your wedding reception with us please use the Halls Booking Enquiry button at the top of the page. The slideshow below shows the halls in action with a number of wedding receptions in full swing. Use the arrows or click on the thumbnails beneath the main picture to navigate through the images. The images below show the empty halls with chairs laid out for meetings or performances. Click on any image to zoom. Our postcode is BS6 7HE. However if you use that for your sat nav, you'll be directed to the houses further along Redland Green Road opposite the bowling club. If you are coming from Redland Road, the church is straight ahead of you as you drive or walk along Redland Green Road. Once you arrive at the church look left and you will see the church halls behind a stone wall across the Green. The halls are next to the Redland Tennis Club and share a road entrance (although not the car park - that is for Tennis Club use only). There is also a pedestrian entrance via a gate off the Green. Please use on-street parking (£1 per hour Mon-Fri 9am - 5pm, otherwise free). There are three spaces in front of the halls but these are reserved for use by church staff and people with disabilities only. However they may be used for a short time by arrangement for loading and unloading purposes when setting up for or taking down after a booking - please speak to our Administrator in the church office if you will need to do so. Full details of the re:new project for the redevelopment of our church halls can be found here.